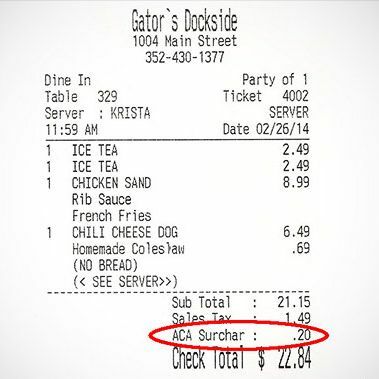 A one-percent surcharge! It’s like an Ayn Rand novel come to life! Conservatives find this development very exciting. Obviously, the restaurateur is thinking about this from the perspective of an angry talk-radio-listening Republican rather than that of a hard-headed capitalist. There are costs associated with all kinds of government regulations and spending, but he’s not creating a line item on his tab to highlight his share of, say, financing the Department of Defense. The main problem here is that, as an act of propaganda, this is completely self-defeating. Customers are told that the dreaded Obummercare may “ultimately” put the restaurant out of business – maybe one day, when the Sharia FEMA camp portion is phased in. But in the meantime, they’re covering it by making the two people buying lunch fork over an additional 20 cents to cover health insurance for the restaurant’s employees. That really doesn’t sound like the worst deal in the world.